Before moving south, I never used a koozie. Ever. Which is just ridiculous because they're brilliant inventions. I mean, they hug your drink and keep it cold. I spent years walking around outside with a naked water bottle as my beverage got warm. When we got married, I wanted to give out koozies as a rehearsal dinner favor. I thought it would be such an amazing idea. It was something I picked up in North Carolina, and since our wedding was in the Tar Heel State, it was perfect. Once we started planning, though, we decided to do an open bar at the rehearsal dinner ... which meant water from a tap, beer from a keg, and wine from bottles. Everyone had cups, so no use for koozies. I loved the idea a lot, but had to scrap it. But you don't have to. Seriously, it's such a great idea that you can make it work. We were at a wedding over the weekend and actually got koozies as wedding favors. We've both already used ours, and I even gave one to the bride when we were out two days after the wedding (because she was putting a napkin around her beer. Koozies are better). There are cute Etsy listings for these (and Etsy is actually where our friends got them for last weekend's wedding. She got them from SipHipHooray, if you want to take a look). Etsy listings can often go out of stock quickly, so, even though I love and support small businesses, the ones below aren't from there. I picked out my top five to get you started. 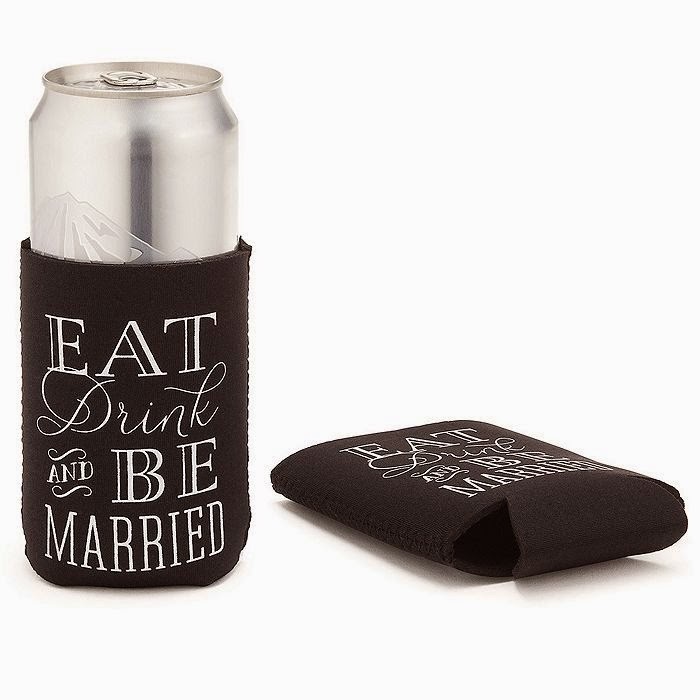 The Eat Drink And Be Married koozies are really cute, simple, and right to the point. Being black and white means they can match any theme, although they look best with a chalkboard theme. Personally, I love multiple fonts on the koozie. It pops that way. We were planning to go that route, had we made these. 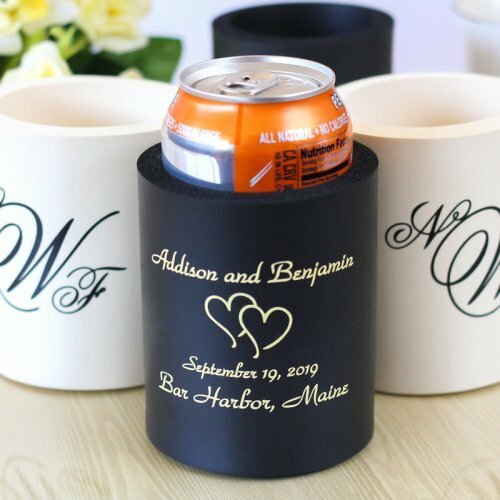 This wedding-themed koozie set is the only one on this list that isn't uniform. It comes with six different pictures: two text only and four mismatched images. Three are pink, two are blue, and one is purple. For someone like me, who had a wedding-specific need for things to be very uniform, this absolutely wouldn't work. But for someone who doesn't like matchy-matchy things, this set is perfect. 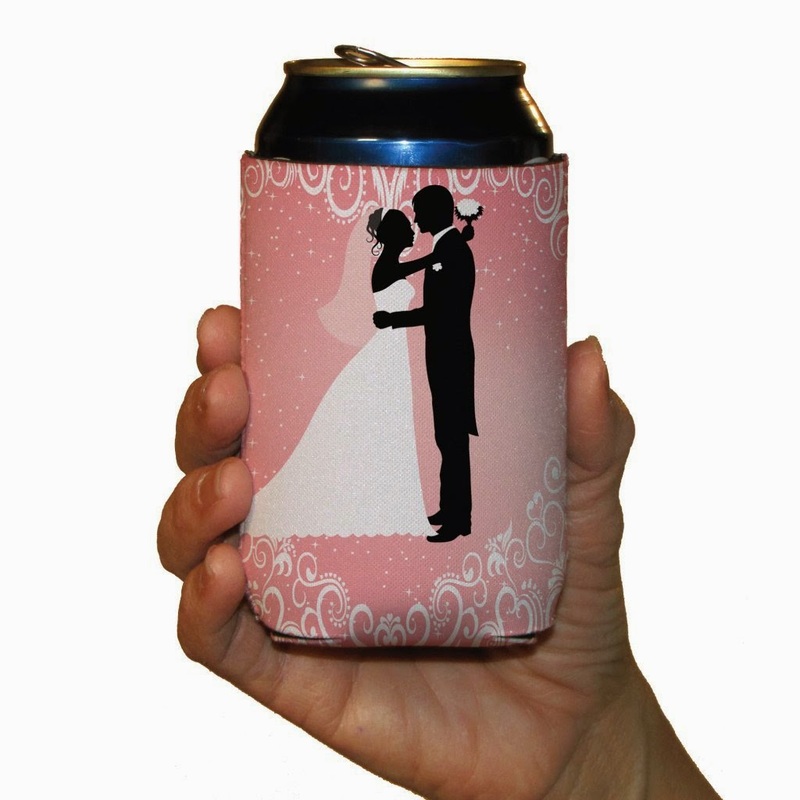 Believe it or not, there's an entire site dedicated to wedding koozies. 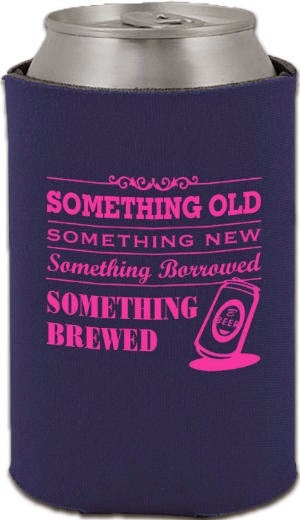 I found this Something Brewed koozie on a site called, quite simply, Totally Wedding Koozies. You can purchase can coolers and bottle sleeves in a variety of materials. The site has a ridiculous amount of designs for everything wedding (there are ones for engagements, save the dates, weddings, anniversaries, bridal parties, and more). You can choose one of their pre-made designs or upload your own. For someone who is a little more hands on, this is the way to go. 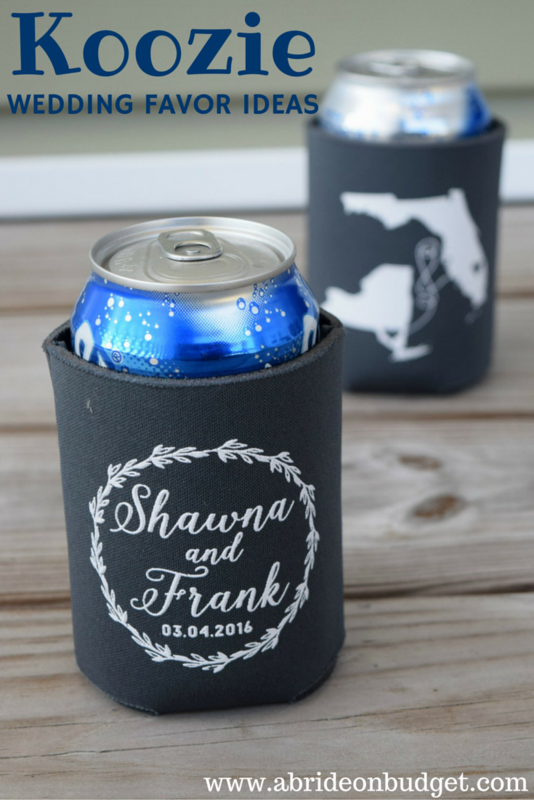 All the koozies we have are thin and flexible, If you want something that is more sturdy, these personalized wedding can coolers are made of a thick foam. You can choose from a bunch of designs and layouts too, plus a ton of colors too. If you want options, these personalized collapsible can coolers are for you. You can choose the style (neoprene or sponge), koozie color, imprint color, font, and more. It's a lot of decisions, but you'll end up getting exactly what you want. And for me, that's what I need. For more favor ideas, check out our favors link. If you're curious, check out what we had as our bridal shower favor and wedding favor. BRIDAL BABBLE: Which of these koozie wedding favor ideas is your favorite? I think it is a great idea, especially for the beach and for picnics. I have never used a koozie before, I figured they didn't work. I love how you can order these personalized. This is a very cute idea to have on cans at a wedding. It really makes the drinks look classy and I did not know they were called koozies! I really like the wedding-themed koozie set! Cute! I would never have thought of this as a wedding idea. I love koozies! This is a great idea! Those koozies are cute !!!!! these are super cute although a little pricey. Those are fun favors. I like the personalized ones best. Like these and do own a few of them to keep drinks cold. Great advertising for companies as well and something we would always use. I think it's great for weddings, never been to one where they have had them but brilliant idea. How cute! No matter where you go, you will always be reminded of your spouse. I would love the bride and groom koozie! What a great party favor idea! I use them a lot of the time and yes, would make nice favours. Better than a solo cup. Cute ideas! I especially like, "Eat, drink, and be married!" I love these ideas I have not seen anything like this before. I've never been a big fan of koozies but I do like that you can personalize them. I would have loved to have these koozies for our favors in our wedding! I absolutely LOVE the state style koozie!! So fun! I like the dark blue ones with the Monogram on them- looks very upscale! KOOZIES, i didn't know that's how they were called, but its been a long time i seen one and use it. They sure make a nice party favor, and the City & State wedding koozie is my favorite. These koozies are so cute! It would be a great way to add your personal touch to a wedding! I really like the s wedding-themed koozie set that comes with six different pictures, two text only and four mismatched images. and in Purple!. I think it's a great idea to give these away as party favors. I have heard of koozies before and I know what they do, but I have never used one before. Thank you for sharing this post. Some of these koozies are much more adorable than any I have ever seen. Awesome! These are cute. I wouldn't mind some for myself. These are cute. I could use one. These are adorable!! I love them! Such a great favor idea!